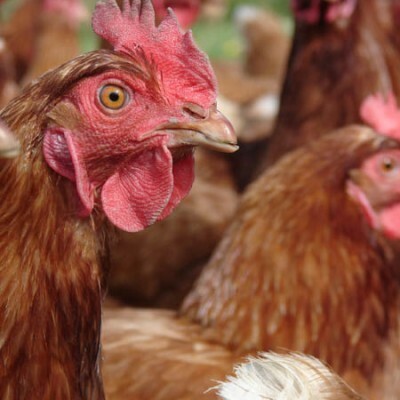 Highlighting a low-cost way to generate energy while using on-farm resources, reducing greenhouse gases, and ending up with a rich fertiliser. Klaus Lotz has had a bee in the bonnet about biogas since he first learned about it at age 17. 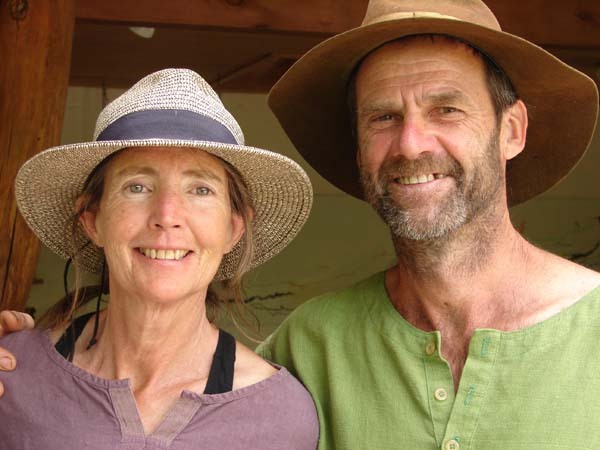 Klaus and Vanessa and their family operate PermaDynamics at Matapouri, Northland, New Zealand’s largest banana plantation (see Organic NZ Vol.75 No.6 Nov/Dec 2016). Biogas is just one product, along with a range of biodynamically grown fruit and vegetable produce. Biogas is a renewable energy resource constituted of 50/50 methane and carbon dioxide (Co2). Methane becomes a greenhouse gas when it escapes but when harnessed it can run gas stoves, cars and appliances, and even whole towns. In Germany many cars are run on a dual-fuel system starting with petrol until the engine is hot then switching to Biogas. Diesel engines can operate on 20% diesel-80% biogas. Biogas has been around for 100 years and was popular in India and China. 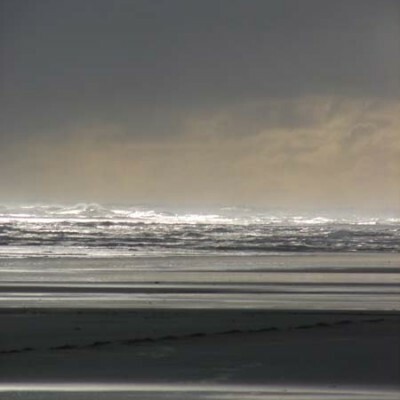 Its use is being revisited in the wake of energy crises, and global concerns around methane pollution. When Klaus first investigated the potential of biogas as a youngster in Germany, only three small systems existed in the country, although eco-progressive Denmark had quite a few. Today, the entire electricity requirements of Wurtzburg, (Klaus’ home town, population 125,000), are supplied by three industrial biogas facilities. Easily stored and converted to electricity, biogas could be used on New Zealand dairy farms at peak energy times such as milking. Klaus says that in Germany many dairy farms use biogas which is fed into a combustion engine (generator) to produce electricity, although a substantial number of farmers have switched to producing silage only (not manure) for the making of biogas. An effluent pond, because it is an anaerobic environment in which methane-generating bacteria (methanogens) thrive, produces methane gas (45 times more potent than Co2), but it escapes to contribute to greenhouse gases. 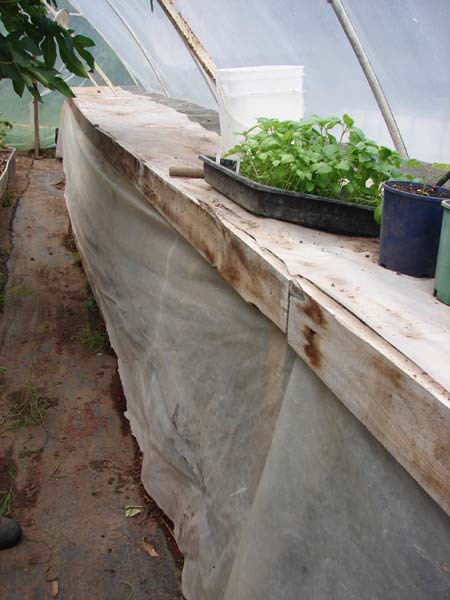 A membrane extended over the pond would provide a simple containment system and allow the gas to be harvested. Biogas systems effectively extend the cow’s digestion outside of the cow and using the very same bacteria. Once dung has been dropped, the methanogens natural to digestive systems die in open air and fermentation stops, making the dung aerobic and producing only Co2. At PermaDynamics, Klaus has constructed a simple continuous system biogas digester of a type that originated with pig farmers in Columbia. It’s known as the ‘chorizo’ type because of its long sausage-like shape. 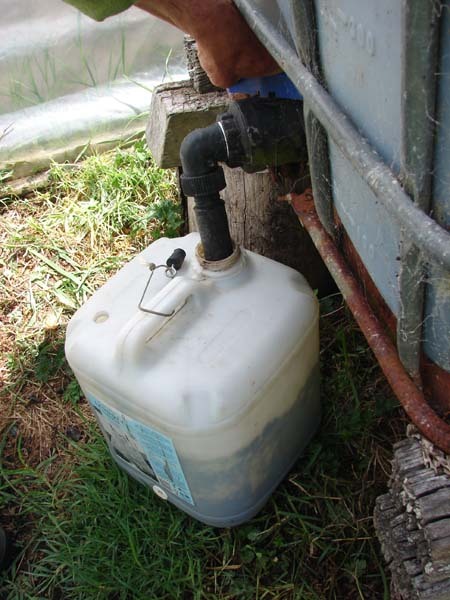 Its maintenance is less labour-intense than other biogas production systems, and the tube form lent itself to installation in the dead space under his greenhouse workbench. The continuous system consists of a plastic skin, which Klaus can see through to determine what’s happening inside, a tank at each end, piping for feeding and drainage, tubing for gas harvest, a storage system, and a safety system. The continuous system allows him to more easily demonstrate for students and clients how biogas production works, but part of the chorizo’s attraction is the low set-up cost. 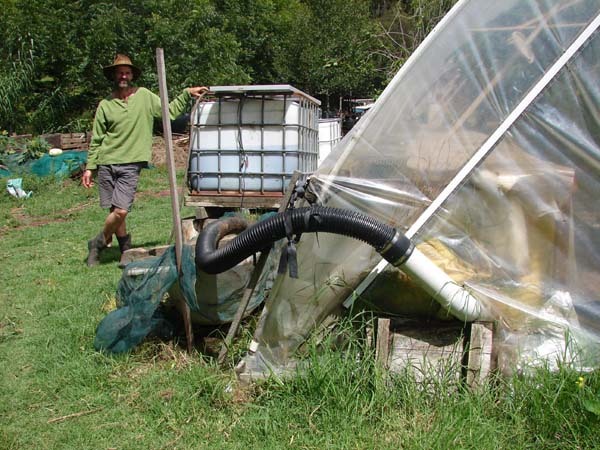 The actual digester (fermenter), is 12 metres long and cost only $50, and the entire system, allowing for resourcefulness on Klaus’ part, cost around $300. 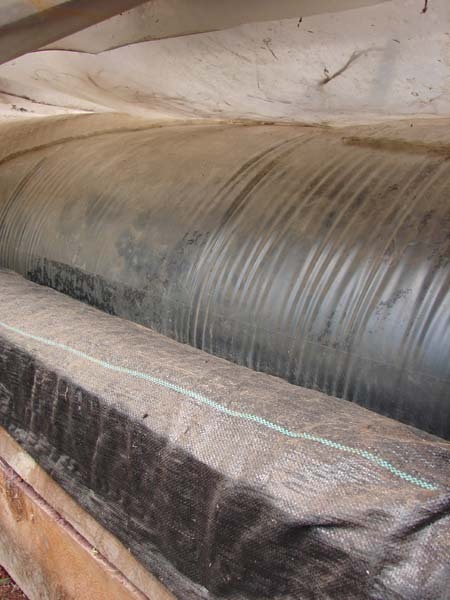 Temperature is critical to a successful biogas digester and ideally should be around 37C. In winter temperatures might fall to 20C but fermentation is very slow. The bacteria prefer non-fluctuating temperatures to produce methane (a greenhouse is ideal because it traps warmth during the day). 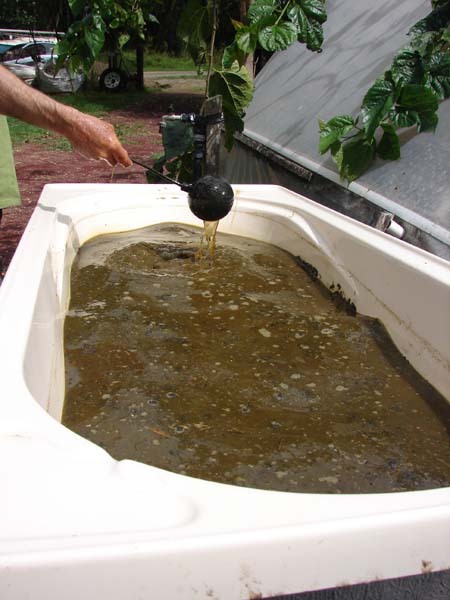 At PermaDynamics, the greenhouse generates the heat that keeps the biodigester fermenting. Then at night when the greenhouse cools, the heat generated by the helps offset greenhouse heat loss, thus they stabilise each other. Initially the chorizo, which inflates to 60cm diameter, was a single-skinned sausage, but wasn’t performing optimally, so Klaus added a second skin. He says it works efficiently now with cow manure, but that a third skin would improve the fermentation process. Every day Klaus shovels half a wheelbarrow load of cow manure in one end of the digester, and harvests nitrogen-intensified fertiliser from the other end. Dung must be fresh or it becomes aerobic. The dung is shovelled into a raised open tank (bath), to allow gravity-fed drainage, and mixed with 50% water. Klaus stirs it occasionally until it becomes porridgey – approximately 24 hours. He then drains it directly into the digester through an inlet set higher than the outlet. The fermenting matter moves slowly along in the digester for around three weeks, being added to daily. One third the way along the digester, Klaus has set up his storage and safety systems. 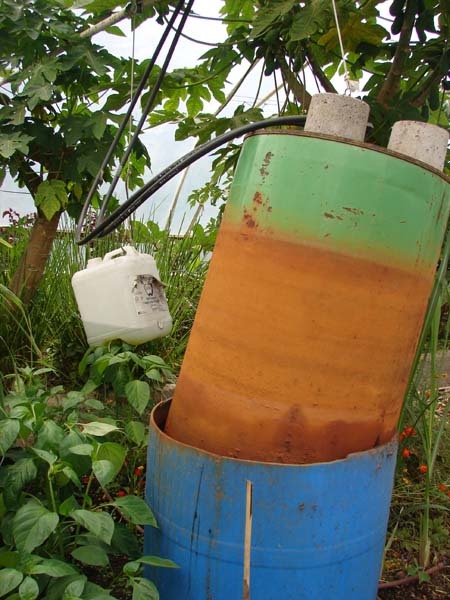 The biogas is released through the double-skin of the digester into a plastic hose to the storage area, which consists of an open-ended steel drum inverted into a larger plastic drum containing water. The smaller floating drum is controlled by a counterweight as well as several weights on top. Once through the digester, the matter is released through mesh into another open tank (bath). The liquid, now a nitrogen-increased fertiliser, is treated with biodynamic compost preps and packaged for distribution onto Klaus’ nitrogen-greedy banana plantation. Biogas is well utilised on Klaus and Vanessa’s property, both in the greenhouse where it is produced (and percs the family’s morning coffee), and at the house 200m away where it fuels an outdoor stove. Domestic biogas installation indoors must be fitted by a certified gas plumber. 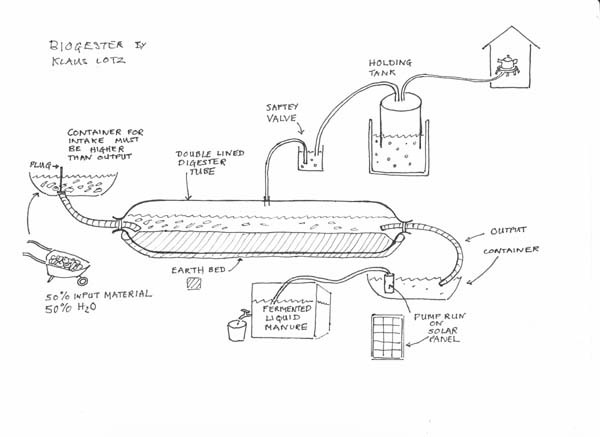 Allowing gas to flow naturally at low pressure and slowly fill the second storage at the house prevents turbulence, making a 13mm alkathene conduit sufficient.To achieve good biogas flow for use as cooking fuel, the inlet jets for supply to the stove require drilling to four times their original diameter to accommodate the lower energy density of the gas. Klaus uses a continuous system, but biogas can be produced in a more compact batch system, usually in drums. The gas is produced in the drum over a month and then emptied, and the process begun again, hence ‘batching’. The advantages of batching include easy eradication of contaminants and clogs, and compactness, allowing for relatively unobtrusive placement in small spaces. In India batch systems are typically run on left over grain harvest materials. They can be set in tractor tyres on roofs, or barrels standing in hallway corners. Starchy source material creates high gas production and a single hectare of maize is sufficient to provide all the energy requirements for five German houses which generally run air-conditioners in summer and heating during winter. It is possible to generate electricity from small-scale systems but Klaus says it’s far too complex to be viable. A filter system is required to purify the gas of sulphur and humidity or they would quickly corrode the generator. However, as a low-cost renewable energy source, biogas could revolutionise New Zealand’s dairy industry. We already employ biogas harvesting technologies which produce 57MW for electricity production from 31 generation sites. Most of these are landfill sites, but other sites process biogas from sewage, feedlot waste, pig and chicken farm waste, and even kiwifruit waste. Permadynamics was certified biodynamic by Demeter in February 2017. Klaus Lotz is a Sustainable Rural Development consultant.